These essays address the relationship of faith and learning at a Baptist institution and come from scholars in a wide variety of fields: theology, law, literature, political science, education, and philosophy. They not only affirm the need for a clear theological vision on which to base institutional and pedagogical planning; they also stress the importance of diversity, pluralism, and true academic freedom. Edited by: Douglas Thompson, Wilfred C. Platt, Jr. 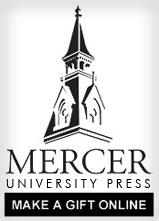 This book is a collection of sermons by Mercer University faculty and staff preached during University Worship between 2001 and 2005. The sermons engage the ways we encounter God in our daily lives. Most observers consider E. Y. Mullins, president of Southern Baptist Theological Seminary from 1899 to 1928, to be the most influential Southern Baptist theologian and denominational leader of the twentieth century. His book, The Axioms of Religion (1908) is considered his most-creative and most-enduring work. The book was received as virtual orthodoxy by Baptists around the world. Complete with a critical introduction, this volume sets a new standard in Mullins study and in the study of Baptist history by restoring Mullins to his rightful place. In December 2005, Mercer University and the Georgia Baptist Convention ended their 173-year affiliation. A meeting of more than 150 church leaders from across the country to explore ways to maintain and broaden Mercer’s Identity as a free Baptist institution serving Baptists not only in Georgia, but around the world. This remarkable collection of essays spans more than twenty-five years as president of Mercer University. As such, they form a corpus of thought by a university president who believes that the university can and does have a role in shaping culture and society, and is a leading factor in the architecture of our future.